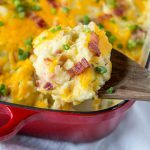 Baked Potato Casserole – a cheesy potato casserole that is great for entertaining, potlucks, or even busy weeknights. 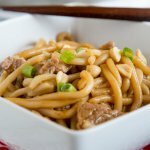 Comforting, delicious, and a family favorite. Cheesy potatoes are a classic for lots of families around the holidays. There is just something about the gooey, cheesy goodness that wins everyone over. My family goes crazy for it with Tangerine Glazed Ham. Growing up, cheesy potatoes were not a thing in my family. 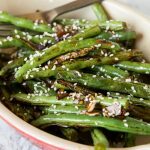 It wasn’t until I met my husband and his mom made them, then they became a staple for us. Now we make them every year, and the rest of my family makes them as well. This baked potato casserole uses a little help from the store with frozen potatoes. But you can definitely dice your own if you want. I can never get them all the same size, so I like the precut ones for stuff like this. Or go all out and make Loaded Twice Baked Potato Casserole, and the size of the potatoes doesn’t matter at all. My mother in-law always makes her with the shredded hashbrowns, but here I went with the diced potatoes. 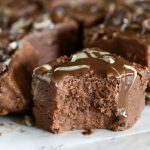 The texture is a little different; I think they hold up a little better to the baking. But they both work really well, so it is personal preference. 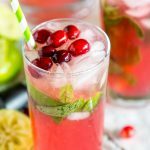 And if you need more ideas for your holiday table, this Cranberry Salad is a must! 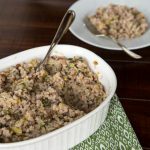 I love this baked potato casserole for the holidays, because you can even make it in the crock pot, and not have to take up oven space. 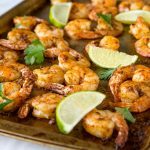 Just let it cook on low for a few hours and you are done, so easy! 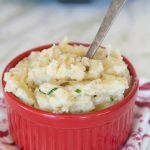 Garlicky Crock Pot Mashed Potatoes are another great side dish. 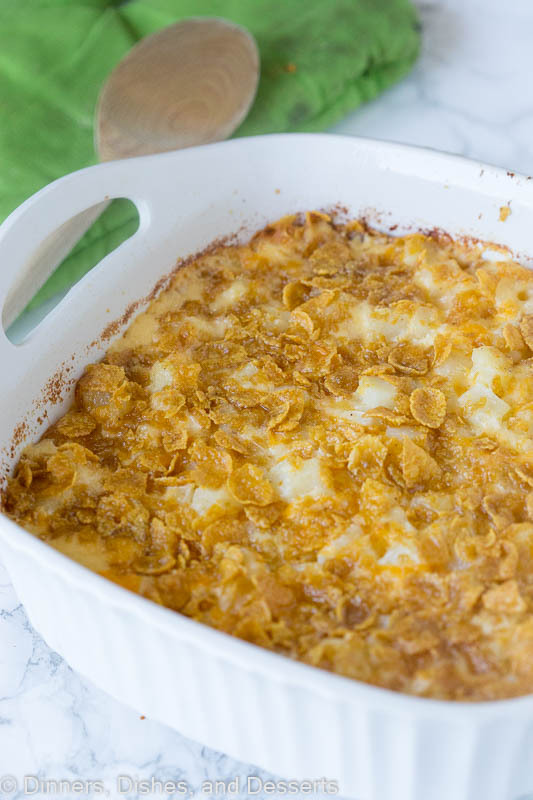 I leave off the cornflake topping if I am doing it in the crock pot, but you could add it at the end and put it under the broiler for a few minutes if you wanted it. 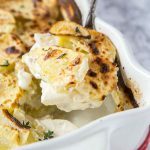 Cheesy potatoes are one of my families favorite side dishes, so I don’t just make it on holidays either. 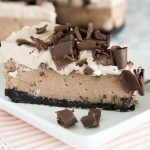 I will often make the full recipe, then divide it into 2 pans, and freeze one for a different night. 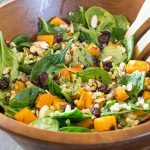 Then all you have to do is thaw and bake for a quick weeknight dinner. 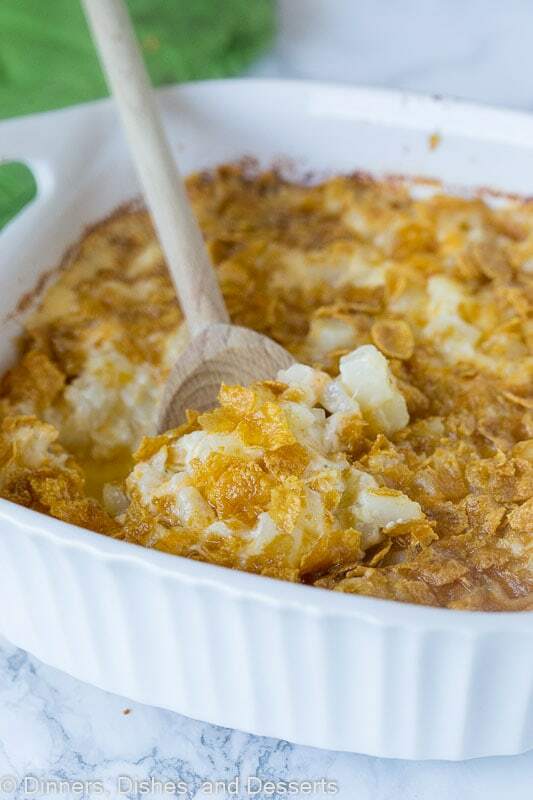 So when you are looking for your holiday sides this year, try this cheesy potato casserole. 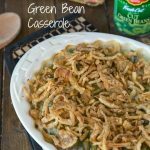 My favorite Green Bean Casserole (no condensed soup) is another staple, that we make every holiday. Preheat oven to 350 degrees. Coat a 13x9 inch baking dish with non-stick spray. Set aside. 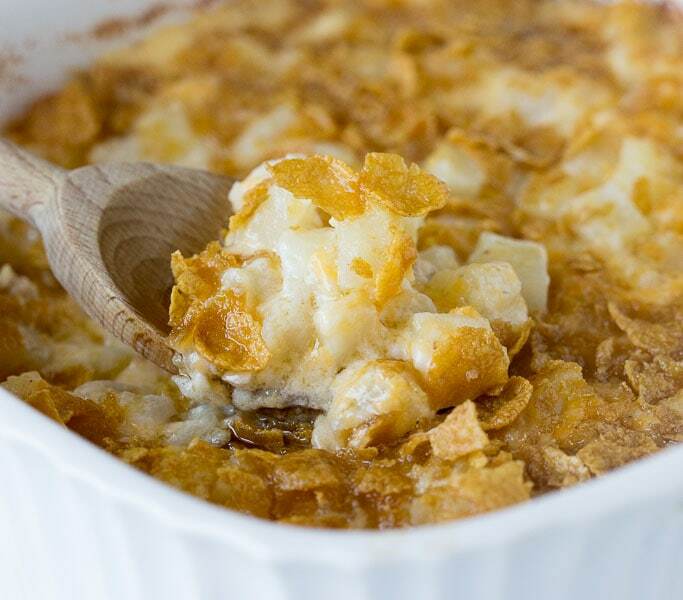 In a large bowl mix together hashbrowns, 1/2 cup butter, sour cream, cream of chicken soup, cheddar cheese, onion, garlic salt and black pepper. Mix until everything is well combined. Sprinkle the cornflakes over the potatoes. Drizzle with the remaining 1/4 cup of butter. Bake for 40-45 minutes until hot and bubbly. You can start with frozen hashbrowns, just increase baking time to 60-90 minutes. Perfect side with our Easter ham! This is a must have at every holiday meal! I had forgotten how much a love this casserole! This is going on my table this weekend! 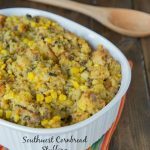 This casserole looks so comforting! 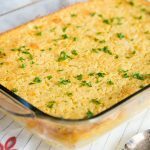 Such a classic, I love this casserole! 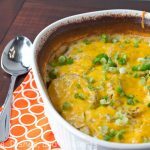 Who doesn’t love a good potato casserole! You can’t go wrong when potatoes are involved! 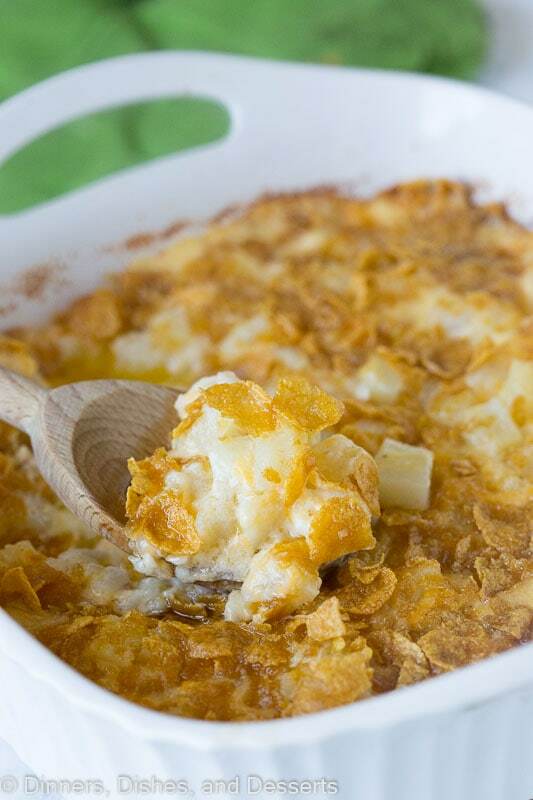 I love how different this recipe is… the creamy with the soup and sour cream then the sweet with the cornflakes. Can’t wait to try this! This looks really good! Really perfect for any occasion!